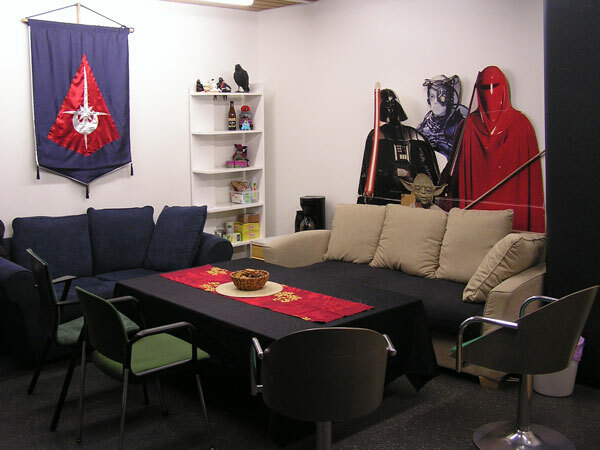 Terrakoti is the office and geek living room of six societies located in Turku. It is a safe haven for everyone interested in science fiction, fantasy, horror, Japanese popular culture, roleplaying or console games in Turku. The societies organize various activities for their members, each with a slightly different focus. Terrakoti brings together fans of science fiction and fantasy, anime fans, roleplayers and console gamers alike. Despite these varying interests, everyone at Terrakoti shares an enthusiasm for popular culture and an interest in meeting like-minded people. At Terrakoti you will find a number of magazines subscribed by the societies as well as three busy libraries. In addition to such comforts as sofas, a kettle and a coffee maker, a fridge and a microwave, there is a chance to buy soft drinks, chocolate, lollipops, ice-cream and crisps. Different events for bookworms and party animals alike are arranged on 5-6 evenings a week. Terrakoti welcomes people of all ages. At the moment, the youngest people who regularly spend time at Terrakoti attend high school, whereas the oldest have passed forty. Although Terrakoti is located at the university premises (Student House B), you do not have to be a student at the university to hang out at Terrakoti. On your right, you can find our calendar that tells you when something is happening at Terrakoti. The societies of Terrakoti also post information on their activities through their Facebook groups, mailing lists and webpages. At the moment Tutka is the principal organizer of social events and get-togethers for Science Fiction and fantasy fans at Terrakoti. It is also best known for casual activities that can be organized with minimal preparations. Tutka also has some annual traditions, for example trilogy drinking games and themed dress-up parties. Tutka and TSFS are small-scale book publishers, and they make pinback buttons that are sold at cons and other events. Tutka is also the main tenant of Terrakoti, and therefore the one responsible we have a roof on our head. Compared to Tutka, TSFS is more literary-based. TSFS is responsible for granting the Atorox award for the best Finnish Science Fiction or fantasy short novel of the year. TSFS also manages an impressive library and co-organizes writing competitions, Nova together with the Finnish Science Fiction and Fantasy Writers Association (FSFWA) and the Noviisi ("Novice") together with FSFWA and Tutka. The main publication of TSFS is the magazine Spin, the oldest Science Fiction and fantasy magazine in Finland. Spin is written and edited for print by volunteers, and the magazine is a crucial part of TSFS activities. TSFS is always looking for people interested in volunteering for Spin, so if you are interested, contact the editorial staff. Senpai (formerly TAS) arranges anime viewings every other Friday and longer marathons on occasion. Senpai also organizes themed events every once in a while. FUI could be described as the Swedish-speaking counterpart of Tutka. FUI organizes ”Kaffeöl” bar meetings, ”Underlig Afton” movie nights and an annual, mostly audiovisual minicon called Bacon. Tyrmä and ANC both prioritize in organizing game nights for their members. The two societies are often in collaboration, and both have their own annual gaming event: Tyrmä holds a gaming event Conklaavi every spring and ANC holds the Finnish national competition for academic Nintendo gaming every Fall. The doors of Terrakoti are held open every Monday, Wednesday and Thursday from 5 to 6 p.m. During this time members of societies can loan from the society libraries, read magazines and books and meet others interested in science fiction, fantasy, anime, manga or gaming. New visitors can come see for themselves what the societies are like and, if they wish, join any or all Terrakoti societies. Presently the Monday open doors are held by Tyrmä, while the Wednesday office hours are held by ANC and FUI, and Thursday office hours TSFS and Tutka. Because of this, enthusiasts of tabletop gaming are more likely to be found at Terrakoti on Mondays, console players or Swedish-speaking geeks on Wednesday and those interested in Science Fiction and fantasy on Thursdays. On Thursdays, the night continues as ”Varjomafia” from 6 p.m. onwards.Varjomafia is a weekly get-together for casual discussion and loitering. It is mostly aimed at science fiction and fantasy fans who prefer comfortable couches to bar chairs or are underaged, and who are happy to have some like-minded company, and possibly a cup of tea to go with. The discussion topics can range from current weather to oddities of the animal kingdom or linguistics and Gallifreyan physiology. All open door hours and get-togethers are open for everyone interested, regardless of age. You do not have to be a member of a Terrakoti society to take part in these casual get-togethers. Another important staple of Terrakoti life are the various movie nights where we watch older and newer genre movies and series together with a bunch of people. Some theme nights are regular, while others are organized every now and then. Regular movie nights include Tutka’s Doctor Who evenings organized every few months, Tutka's and TSFS's monthly “Varjomafia goes to movies” featuring a Science Fiction or fantasy classic as well as the biweekly Senpai anime evenings. Most movie nights are held on Fridays or Saturdays. Game nights are held by Tyrmä and ANC. Tyrmä organizes game nights for playing rolegames, boardgames and card games biweekly and monthly, as well as special game nights every now and then. ANC organizes console game nights at least once a month and game themed hang-outs every other Wednesday. Lately, also FUI has started to organize game nights as well. In addition to the more regular activities, the yearly life of Terrakoti and its societies includes parties, anniversaries, meetings and other events. May Day is celebrated on Terrakoti in May, November is the time for Halloween, and the Terrakoti little Christmas party is held in November. New Year and other holidays may also call for celebration. Most Terrakoti activities are open for everyone and membership is rarely required. Choosing to join one or more of the socities at Terrakoti should be based on your own interests. TSFS has an annual membership fee of 5 euros. With the prescription of the Spin magazine the membership fee is 15 euros in total (prescription for Spin is 20 euros for non-members). Minors get membership with Spin for only 7 euros. Among other perks, TSFS members get access to the impressive TSFS/Tutka joint library. The annual membership fee for Tutka is 4 euros. The membership fee is kept low so that all interested would find it effortless to join. The members get access to the TSFS/Tutka joint library, as well as occasional discounts on entrance fees or joint accomodation for Science Fiction related events. The membership fee for Senpai is 5 euros per year. The members of Senpai are given discounts at several shops in Turku, and members also get access to the Senpai library. Check the Senpai webpage for more information. The annual membership fee for FUI is only 2 euros, and it’s worth paying for all interested in Swedish-speaking fans of Science Fiction, fantasy and anime in Turku. Tyrmä has an annual membership fee of 10 euros. In exchange Tyrmä organizes game nights and gaming events on a regular basis and grants access to an extensive boardgame library. You can also get discounts at some game shops in Turku. To join ANC you have to be a student at the university of Turku. With that you get a membership for not only the current year, but the next two years as well. All members also get a cool ANC membership patch, as well as other perks. See also Terrakoti on the map. If you want to send mail, address it to the appropriate society. There is no email address for contacting Terrakoti as a whole, but you can contact any of the six societies by email. Some societies have specific contact persons for various subjects, but for others you can simply contact the board. Terrakoti societies all have mailing lists and Facebook groups for spreading all kinds of information related to their activities. Most of them are free to join even if you are not a member, but be aware that the notices might not be available in English. The best way to find Terrakoti is by locating the ”academic” Hesburger at Hämeenkatu, the Student House is right behind it (after some grass and parking space). The B-side is on the other side of the wing of the building (so not the side with the student restaurant Assarin ullakko, but the side with the bar Proffan kellari). Roughly to the right from Proffan kellari there is a sign that says ”Osakuntalaisia osissa ja muuta kummaa”. Walk through the door and continue along the corridor to the right. Terrakoti is towards the end of the corridor on the left side.